Digital content serves as an important source of inspiration for women planning their next grocery trip. As part of the 2015 POPSUGAR Insights Food study, we surveyed female visitors to POPSUGAR to better understand their grocery-shopping behaviors. 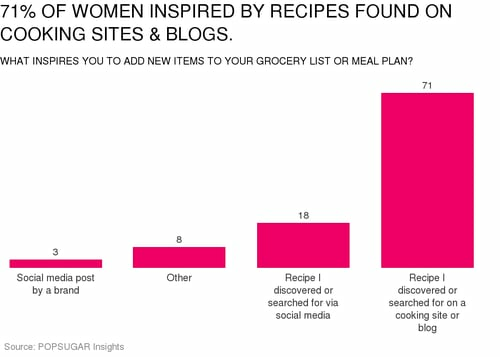 We discovered that 93% of women go online to discover new recipes or to find foods to add to their grocery-shopping list or meal plan. Overall, endemic food content sites act as the primary source of inspiration, with 71% of women being inspired to add new items to their grocery list or meal plan from a recipe they discovered or searched for on a food or cooking site or blog. Social media is the second most popular source of inspiration, with 18% of women saying that they find inspiration in a recipe they discovered on their social feed and 3% being inspired by a post by a brand they follow on social media.